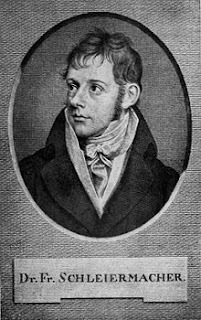 In a time when religion had nearly been discarded by German intellectuals following Kant, Friedrich Schleiermacher presented it in a new light which reinvigorated interest and made him the founding father of liberal Protestantism. How he accomplished this was in large part a matter of his skill for neologizing. In this post, I consider how Schleiermacher defines religion, which he also calls piety, as well as what relationship there is, in his view, between Christianity and religion. We will begin our inquiry into Schleiermacher’s religion by first understanding what he wanted to clarify was not the essence of religion. Schleiermacher challenges the widespread belief that religion was a combination of doctrines and actions, or knowing and doing. A. Religion is Not Knowing -- Schleiermacher rejects knowledge as the field of religion: “Religion is not knowledge and science, either of the world or of God” (On Religion, 36). Knowledge is the field of science, which is why religion can not be acquired by the scientific method and study (102). Particular doctrines and dogmas about miracles, inspiration, revelation, and the like are not necessary for religion itself and do not make one pious, but merely spring from reflection on true religious experience (87-88). Schleiermacher denies any tie between knowledge and piety. “Quantity of knowledge is not quantity of piety” (35) which is why, he suggests that though a theologian may have more knowledge than a layperson, he is not necessarily more pious (102-103). Religion, according to Schleiermacher, is not a matter of what is thought or believed. B. Religion is Not Doing -- Theologians before Schleiermacher had pared down religion to universal morality, but he rejects any essential connection between religion and activity, ethical or artistic (28). To be pious does not denote “a way of acting” or “a special kind of conduct and character” (27) because “religion by itself does not urge men to activity at all” (57). So distinct are religion and activity that one with pure religion might be accused of “idle contemplation” but never of “cruel and horrible deeds” (58). Whereas morality is a matter of self-control, “piety appears as surrender” (37). By asserting the distinction between ethical behavior and religion, Schleiermacher does not wish to deny that religion leads to morality, for he says “I do not mean that...a man might have religion and be pious, and at the same time be immoral. That is impossible” (38). C. Religion is Being -- Schleiermacher’s religion is a matter of “feeling,” but this term is quite difficult. He most certainly is not referring to what we call “emotions” but something closer to “perception.” Religious perception is more like “intuition,” which is perceived, than knowledge which is thought (44). It is something that is known “immediately” (54). Feeling could perhaps be called heart-knowledge (44, 59, 66). By calling true religion “sense and taste for the Infinite”(39), Schleiermacher gives the idea that it is accessed by a sixth sense. It is true that religion is essentially contemplative. ...The contemplation of the pious is the immediate consciousness of the universal existence of all finite things, in and through the Infinite, and of all temporal things in and through the Eternal. Religion is...to have life and to know life in the immediate feeling, only as such an existence in the Infinite and Eternal (36). In moments of perception the pious individual grasps, without the mediation of the mind, the connection between all finite things and the Infinite in and through one another. The finite self, in the perception of the Infinite, experiences “absolute dependence” and dissolves in this perception (106). Schleiermacher’s religion is certainly internal, rather than external and in this way is more like knowledge than activity, but the internal contemplation of religion is intuitive rather than thoughtful like knowledge. Religion is indeed thoughtlessness “in which all other known activities are set aside or almost suppressed, and the whole soul is dissolved in the immediate feeling of the Infinite and Eternal” (15-16). The longer quotation above raises the question of how religious feeling is attained. If religion is not practiced by study or morality, how then does one become religious or have religious perception? This will be the query of the next section. D. Stimuli for Religious Experience -- Schleiermacher struggles to offer direction to those whom he has persuaded to seek religious “feeling.” He rejects “fear of the powers which rule in nature” (63) and “joy in Nature” (65) as sources of religion, for “what is so doubtful cannot be a religious stimulus” (66). Though Schleiermacher suggests that his readers consider how in delineating an object they lose themselves (42) he also admits that “It is impossible...to adduce any definite example” (41) and later directs attention to the broadest and least tangible objects of contemplation. The best sources of religion are the eternal laws of the world, humanity and history. Both “the rules of mechanics”(68) and “the irregularity of the world”(68) can lead one to perception of the Infinite. Schleiermacher calls humanity “one of the oldest sources of poetry and religion” (71). History is “immediately and especially...for religion the richest source...because it is the greatest and most general revelation of the deepest and holiest” (80). We encounter religion best through contemplation on the intersection of the finite and Infinite. In the end, all things are potential stimuli for the pious because any single thing is part of the Whole and can be “an opening for the Whole”(106, 84). One’s own self is indeed a great opening, for Schleiermacher proclaims: “You are a compendium of humanity”(79). Given Schleiermacher’s criteria, how might Christianity examined? Doctrine is not essential to religion, so the kernel of religion in Christianity is not its teachings. The tenets of Christian theology are but human reflections upon true religion. Schleiermacher does retain neologized Christian doctrines as fit accompaniments to religion. In Schleiermacher’s view, true religion involves the loss of personality and self, so the impulse for immortal consciousness in the traditional doctrine of immortality is to be replaced with a neologized one. Immortality, for Schleiermacher, is “in the midst of finitude to be one with the Infinite and in every moment to be eternal” (101). In as much as one is religious, and experiences self-evaporation on this earth, one is the tasting the immortality of the after-life. Regarding God, Schleiermacher suggests that religious experience can legitimately lead to either a pantheistic or personal God. The view one takes depends on the limits of one’s imagination. He who can not conceive of a pantheistic God will maintain a personal one (97-98). Jesus, the heart of Christianity by any account, is seen by Schleiermacher as a temporary mediator. He was a pious man who mediated the Infinite to limited humanity (6). For the pious, like himself, no mediator is necessary for they experience the Infinite immediately and without mediation (79). Schleiermacher rejects “absolute miracles,” or miracles as traditionally defined, but seeks to acknowledge and retain “the religious interest in the miraculous” (114). He argues that because all events are alike “in respect to divine causality” (114) all events are miracles. “Miracle is simply the religious name for event” (88). Of Scripture he says, “the man who has a lively and immediate understanding of it...could most easily do without it” (91). What Schleiermacher calls the “operation of grace” (90) is the bi-directional movements of religion. First is “the entrance of the world into man,” or “revelation,” and second, the “outgoing of man into the world, through action and culture,” or “inspiration” (90). Schleiermacher, here, surprisingly unites action and religion. He also admits a connection between religion and ideas because “religion requires, or can adopt ideas” (47). The ideas and practices that can be called religious are those that have originated in the individual and are “the outcome of his own feeling” not merely echoed as a matter of faith (47). Christian ideas and practices may indeed be religious, and Schleiermacher would claim for himself that they are, so long as they have sprung from one’s own reflection on the kernel of religion, experience. The aforementioned Christian ideas are dubbed “the first and most essential” (90) religious ideas. Although doctrines and practices do not belong to the essence of religion, religious experience does call for reflection. Doctrines and practices are “the necessary and inseparable outcome of the heart” (17) and “the result of...contemplation of feeling” (87). Religious experience calls for action and speech (89-90) but these must not be narrowminded: “That systematic treatment of religions conceptions is the best which...does not take the conception and the idea for original and constitutive” or unchangeable (109). It seems that as religious ideas go, Christianity’s ideas, after neologizing, are considered helpful. Schleiermacher is adamant that each individual remember that their doctrines and practices were subject to nothing and no one but their own religious epiphany. While religious experience is not uniquely Christian, Christian doctrines, albeit neologized, can be the result of the reflections of the pious upon religious feeling. Religion, according to Schleiermacher is infinite, and can not be understood by only one set of religious doctrines but only by the sum total of all (54). The truly religious Christian “must be conscious that his religion is only part of the whole” (54). What makes Christianity distinct from other faiths is not essential to religion, but matters of belief and practice. Religion is not ethical behavior and it is not belief in doctrinal formulations, but religion is the only legitimate source of these. Religion is the experience of the dissolution of the finite self in the perception of the Infinite. Schleiermacher self-identifies as a Christian because he feels that his neologized Christian doctrines are his authentic reflections on his own religious feeling. By neologizing a host of terms, most importantly “religion,” Schleiermacher revived interest in the religious in a culture that despised traditional doctrines while holding on to so-called universal moral practices. *I wrote this essay in 2007 as a Master's student. While I am sympathetic to Schleiermacher's goal of translating Christianity for its cultured despisers, I agree with the many who have critiqued his effort, concluding that what he produces is no longer meaningfully Christian. Schleiermacher uses the term “perception” to refer to what is known (45) through the five senses. I use it to refer to what is felt through the sense for the Infinite. Christian ideas and practices can be religious, but they can not be religion’s essence. I appreciate this. Informative, well-organized, and succinct. Thanks for sharing! If the become ordained online, its officers, and its congregants are prepared for visitors, you can enjoy the unexpected guests, and make them feel welcome. Whether they end up joining your church, or you never see them again, you will have left them with a positive impression of your church.